Aberdovey Haven07980106347work Self-cateringDelightful cottage with lots of character which has been lovingly restored and tastefully decorated. Situated in quiet part of village yet only 5 minutes’ walk from sea front, beach, local shops & restaurants.10 minutes walk from train station. Delightful cottage with lots of character which has been lovingly restored and tastefully decorated. Situated in quiet part of village yet only 5 minutes’ walk from sea front, beach, local shops & restaurants.10 minutes walk from train station. Pretty, sunny front terrace with table and chairs. Beautiful views of estuary and hills. High chair rental: £10 deposit; £2 per day / £12 per week. Travel cot rental: £20 deposit; £5 per day / £30 per week Children welcome from any age. Aberdovey village is on the A493, 4 miles from Tywyn and 9 miles from Machynlleth. If your sat nav directs you to avoid Tywyn/Machynlleth, please ignore and drive through these places. Neither is large or likely to be congested. Sat nav 'short-cuts' will take you down very narrow farm lanes and don't save much time. The entrance to Copperhill Street is in the centre of the village - opposite the wharf gardens and tourist information centre. 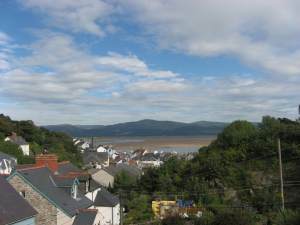 Aberdovey Haven is a pink cottage on the left after you drive under the railway bridge. Access slope begins outside No 28. If no space available when you arrive, the road is wide enough for double parking while you unload. approach to cottage and garden shared. Cottage at top of gently sloping path (shared access). Access to path via four wide & well-maintained steps and handrail. Two small steps into front garden. One clearly marked small step from dining area to kitchen Access to 2/F loft bedroom via steep and narrow stairs. Ceilings sloping and low in places. Velux roof window with safety bar fitted. Rear garden at top of steep steps with sturdy handrails on both sides. Access to upper patio via steps with handrail along one side. Both patios have fencing/railings all around. PLEASE NOTE that the stairs leading up to this room are steep and narrow (42 cm wide) so will not be suitable for all. Because stairs are steep, it's advisable to descend as on a ladder. Also, because of the venetian blind cords and velux window, this room is not suitable for young/unsupervised children (even though there is a safety bar fitted across the window). There is a gate at the bottom of the stairs which can be secured by parents. All 3 bedrooms have blackout curtains and / or blinds. Electric fan in each bedroom and electric blankets on all beds in cooler months. PLEASE NOTE: Access to the rear garden is via steep steps. Even though the steps are fitted with sturdy handrails on both sides, THESE STEPS MAY NOT BE SUITABLE FOR ALL. Elderly / young visitors or those with walking difficulties will need to be accompanied on the stairs, as will young children. Having said that, please note that one regular visitor who is in her mid-80s and walks with a stick, considers the ascent to be well worth the effort!